My province is considering distracted driver legislation. It has been rumoured to include things like texting, shaving while driving, talking on a handheld device, etc. If they really wanted to get to the heart of distracted driving though, they need to include getting into the car with my kids. I used to think driving with a screaming baby was distracting. NOT EVEN A LITTLE compared to driving with Sir Talks a Lot and his sidekick Chatty- Chatty Kick Kick. Spud: But it HURTS. What should I do? Me: (While simultaneously changing lanes and silently cursing texting teenagers and the parents who give them cellphones) Just close your eyes. Spud: But I will bump into things!!!! Me: In your car seat? Spud: At the house!!! I'll never see again!!!!!! Me: (realizing again that drama is not limited to women) honey, it'll feel better soon. I promise. A few more minutes of wondering if all drivers on the Deerfoot are blind and drunk. Spud: My eye is better now. Me: that's great!! I told you it would get better. Spud: (with a derision usually only found in teenaged girls) I did not DO anything that you said. You didn't help at all. It just got better. Insert few moments of correction regarding attitude. Spud: My leg hurts. What do I do? The Block is One of Life's Little Mysteries. 1. Spud is a complicated kid to get gifts for. Usually what I think he would like he looks at, gets excited for 3.6 seconds and then goes off to sing and wave a block around in the air. This year we bought him a CD player and I suggested to his Auntie that he might like tickets to a movie. 2. I am a genius. He loves listening to his CD player with an everlasting love. Even on our vacation to the beach he was constantly telling people how much he missed his CD player. The relaxer boy loves NOTHING more than to go to his room, turn on his CD player, wave a block around and sing. 3. The movie was also a BIG hit. With one dire consequence. He is now obsessed with Toy Story Three. Actually, I think obsessed is a bit too mild of a word to describe the love affair between my boy and Pixar's latest attempt to rid parents of all their money. 4. I have not seen the movie, but I am now able to give an accurate plot synopsis. Quite honestly I think I could do a dissertation on the thing as that is ALL I have heard about from my son since he saw the movie. TWO MONTHS AGO. Two VERY LONG months ago. 6. So imagine with me the SHEER joy of finding a Buzz LightYear costume at a consignment store today. In Spud's size. If I thought I could have gotten away with it I would have danced on the checkout counter. 7. So, tonight a VERY happy young man has gone to bed to "think about my wonderful new costume." I guess sometimes one needs a break from waving a block around and singing. For more Pixar free takes please see Jennifer at Conversion Diary. They were running behind. And little mouths were thirsty. And little hands were disobedient. And a mommy who is covered in tired snapped. And scolded. And generally did everything she prays so hard not to do. And there was a gentle voice that showed the mommy the crying child. And the mommy instantly repented. She cuddled. She apologized. She was hugged back with abandon. Maybe this is what grace looks like. They haeded out into the sun, laughing, joking, running. Two little hands slipped into hers, no mention of the previous moments, just complete trust in her. Is this what grace looks like? The falling, the stumbling, the mommy trying to make her way through a day, a day filled with love and ordinary moments and a just few moments of failure. Then they ran ahead and the sun was so brilliant that it blotted out the distinguishable and all the mommy could see was their outline bathed in gold. They were them, and they were light. Pure light. A sinner stumbling forward, falling, rising and bathed in His light. I've been tagged for a meme by the incomparable Tonggu Momma who is starting to get the nest ready for the arrival of their second daughter. Who they have been waiting for over 50 months now. I kid you not. The woman has learned her some patience over the past four years. TM is one of my biggest commenters and one of my favorite imaginary friends so I feel it is only fair I do her meme. That and it has actually been nice out so I have no time to think of something creative, I am too busy enjoying the warmth. 2. If you could live anywhere in the world, where would you and why? I quite like where we live right now. The mountains are close, my family is close and Way Cooler is working a job he LOVES. This seems quite ideal to me. Plus, being here means that I am not moving. I've done that a lot. It's highly over-rated. So here is good. 3. Have you ever been searched by the cops? No. I'm law-abiding to a fault. Mainly out of fear. I've only even been pulled over once and that almost made me puke I was so scared. We've gotten to know a lot of police officers over the years and so my fear has lessened, but I am still rather afraid of any police type encounter. 4. What is the one thing on your mind now? I am currently psyching myself up to put two slightly punchy little boys to bed by myself. Usually this is no big deal but tonight I am facing a lot of exhaustion after a VERY busy week and I must confess I have contemplated letting them stay up watching TV until they just fall asleep on the floor. So, whose gonna nominate me for mother of the year? Anyone? Anyone? 5. Favorite song right now? Don't have one. Least favorite song? ANYTHING sung by a cucumber and tomato. 6. What talent do you wish you had? I wish I could draw or paint or play an instrument or sing or understand math or dance or play sports with any measure of skill. Any of those would be fine. All would be FANTASTIC. So would owning a unicorn. And the latter is going to happen a lot faster than the former. 7. Favorite Drink? coke zero. But please don't tell anyone, I really do not need any more snide comments about what artificial sweeteners are doing to my brain. 8. In one word, how would you describe yourself? Oh heavens. I have a BLOG. Which means I am fairly self-occupied and verbose. I can barely describe myself in one well-written essay, let alone a word. But enough about me, what one word would YOU use to describe me? Apparently my last post has sparked all kinds of controversy. As well as bringing shame to my entire family. Let me clarify. I used the serving spoon to move the chunks of tomatoes, THAT HAD NEVER TOUCHED MY MOUTH back into the bowl. I may be a geek, but I do have some class. Sorta. Is it just me, or do kids have more days off of school than they used to? Spud went three Fridays, than he got one off, attends one, gets the next off, goes for two, gets the next one off, goes for one, than one off, two, than one off and gets the last Friday before Christmas off as well. Of the 16 Fridays this semester he gets six off. Plus Thanksgiving Monday, Remembrance Day and Labour Day. Upon reading that last quick take, I realized it made me sound 150 years old. Next thing you know I will be smacking my gums and talking about walking 17 miles to school, barefoot and in the snow. And then I will have an early lunch, pull my cardigan around me and take a little nap. After two weeks of completely unreasonable cold, it was warm this week. About as warm as what we had most summer. Seriously. I heard on the radio the other day that our city motto really should be: Calgary, the city that summer forgot. It was utterly GLORIOUS to be outside with the kids. I had to resist the urge to break into song when walking Spud to the bus. But seeing as how I don't want to permanently scar my children, I refrained. Today is my baby sister's birthday. She's had a DOOZEY of a week, the highlight of which was her two year old son climbing onto the counters and attempting to cut himself an orange with a serrated knife. GOOD TIMES. Fortunately it was nothing that could not be fixed with a My Little Pony Band-Aid. However, I am certain she would love any birthday comments you would like to leave her. I know I keep saying this. But I am coming to the conclusion that it is high time I started wearing make-up. Today I looked like a ghost with a hang-over. Pretty soon I am going to start scaring small children. I have made it my goal for October to figure out what I need to wear and how to properly put it on. My goal setting skills are astounding are they not? Somewhere across town my sister in law is jumping up and down for joy. She is now about to text me, "yes, you really do. Can I come pick some out for you?" 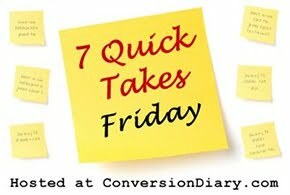 For more quick takes, please see Jennifer at Conversion Diary. And while you are there, please check out her post on prayer. This post has impacted me in a HUGE way this week.